For many Americans illegal immigration is an issue that only makes an appearance on the national consciousness around elections. As a sign that the debate about reform is once again receding into the background, on December 30, 2012, the Los Angeles Times reported that immigration reform discussions intended for the current session of Congress will be passed forward to the spring to make room for tax and budget deals. The very nature of the underground economy and its shadows across America makes it easy and even desirable for us to ignore it. 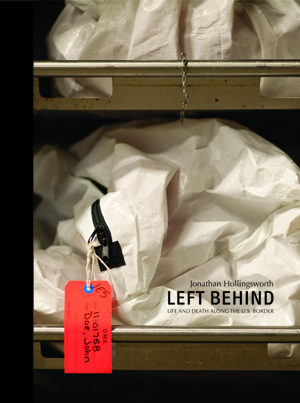 In his recent book Left Behind: Life and Death Along the U.S. Border, artist Jonathan Hollingsworth reasserts the realities of illegal immigration on a human level, making those realities hard to forget. His book is an eloquent statement that underscores the concrete consequences for some who pursue their version of the American Dream. As thousands flee northward across the Mexican border each year, a life and death struggle plays out that often leaves behind the vanquished, anonymous and alone. Hollingsworth reestablishes the humanity of these crossers by highlighting their personal effects found in the archives of the Pima County Forensic Science Center, Arizona. The book opens with a short essay by Gregory Hess, the Chief Medical Examiner at the Center. Hess explains, “From 2001-2011, 1,911 foreign nationals who have died in the deserts of Southern Arizona have passed through the doors of the Pima County Forensic Science Center. Often these individuals have left something of themselves behind as they walk the desert; clothing, photographs, backpacks, trinkets, and sometimes their lives. The obstacle these decedents present, other than processing the sheer number of deaths, is identifying the unidentified.” Hess expresses his hope that these images that remember the dead will also help the living by bringing about further dialog on immigration reform. 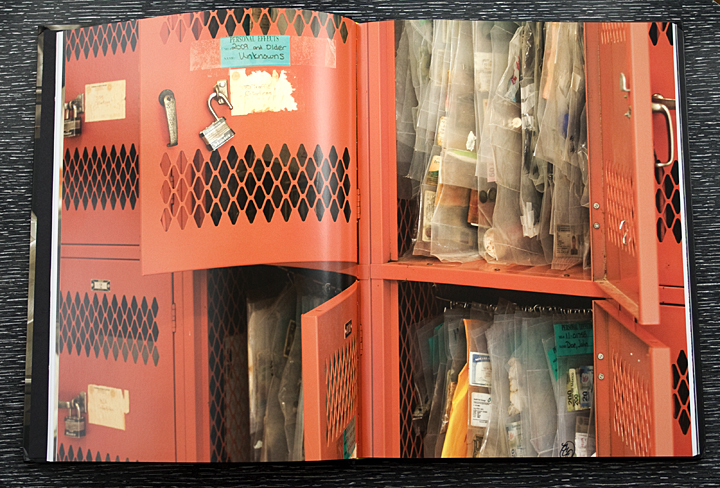 Left Behind begins with photographs that document the cataloging and examination spaces at the Center. The majority of the book is the second section, which presents the sleeves from the archive that contain the personal effects found on the bodies recovered in the desert. These sleeves are marked with a tag for the respective Jane or John Doe; the repetition of this tag across multiple images echoes Hollingsworth’s use of the poster as portrait in his first book, What We Think Now (2006). The size of Left Behind, 12 x 9 inches, is well suited for the display of the sleeves in which the various objects are laid out vertically. The sleeves offer a clinical view of their contents; as photographs, the sleeves work best when their contents are shown roughly to scale and the reflection from the plastic is minimized. Most of the contents are readily identifiable; prayer cards for the Virgin Mary and rosaries were frequent companions on this journey. The presence of money both American and Mexican is frequent, but there is so little of it in any one sleeve, either due to poverty or theft, that the money becomes a talisman rather than a practical tool for survival. Many names and phone numbers surface in the effects; some are contacts for a new life, and others for friends and family seem to predict the eventual end of this journey for many. Knowledge of Spanish will help you access some of the details of the artifacts in the sleeves. However, you don’t need to know a word of the language to understand the heart-wrenchingly simple note “Mi Mama” with telephone number carried by John Doe 11-01516. The sleeves and the testimony they contain are strong enough to stand by themselves, and they make a compelling and decisive heart to the book. The sleeves are photographed against a white background, which gives these spreads an air-filled look that feels appropriate for memorial. In contrast, the descriptive environmental sections that open and close Left Behind use several full bleeds and have a darker, more claustrophobic effect. Near the end of the book is a subset of images that shows articles recovered by a group that provides aid to distressed crossers. This non-profit organization takes all items that can be recycled back to Mexico to be redistributed to border crossers who have been deported. And with that return, the journey begins again for many. Mary Goodwin is a photographer and writer based in Indiana.